It hasn’t even been a year since I built my new workstation and already, something seems to be amiss. Lately, it seems I haven’t been sleeping so well, because there seems to be an angry beast in my room. Whatever it may be … it’s driving me nuts and I’m going to get to the bottom of it. The first step was just to diagnose what was causing the noise. The computer has quite a few fans – one 120mm in the power supply, three 120mm exhaust at the top, a 200mm intake, a 140mm rear exhaust, two 80mm on the GPU and a 140mm in the CPU heatsink. I always tend to err on the side of more airflow as an overclocker with a staunch preference for air cooling – a little more airflow noise is no big deal in my book. At first, I put my hand on the various grilles on the case to try and feel where the vibration is strongest, to localise the problem. It seemed the top exhaust fans were prime suspects. Deciding that I didn’t have the time to take down the system, I opted for live surgery on the machine. I started by unplugging fan leads and noting what the change in sound was, followed by plugging it back in to confirm I wasn’t hearing things. As it turns out, the three CoolerMaster SickleFlow X 120mm 2000 RPM Green LED fans I chose for the top exhaust were probably a bad choice. Of the three fans, one was relatively fine, whereas one did the “galloping” and the final one made the “grinding”. While they were an affordable AU$8 a piece, according to my hard disk timers, they only lasted about 6,600 hours each. This is a far cry from the claimed life expectancy of 160,000 hours. The latter was immediately removed from the case and was found not to be as dusty as expected. On examination, the rotor was clearly unbalanced – this suggests maybe poor quality bearings and construction quality caused a premature failure. The galloping fan was left to continue, but might need replacement soon. This one was replaced by an old Antec fan pulled from my old workstation which had already done 25,000+ hours which helped things quiet down somewhat. 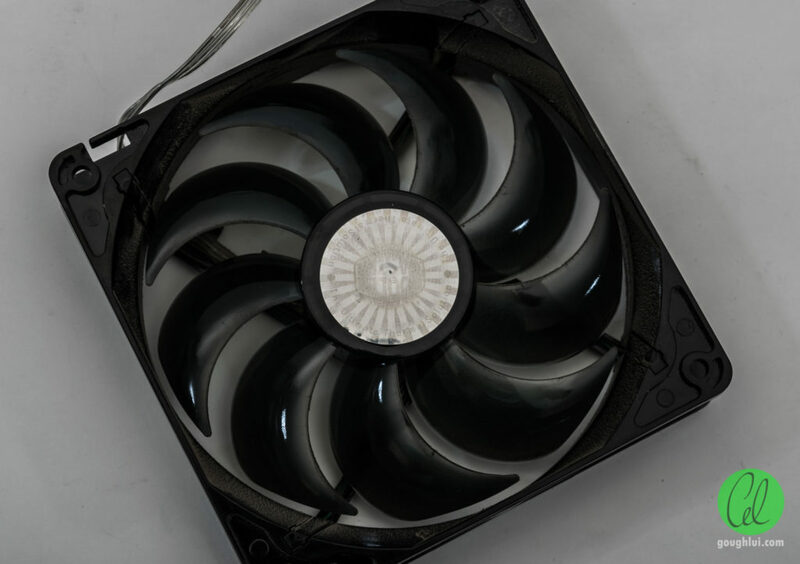 It definitely concerns me when I have significant case rattles – I suspect that vibration from bad fans could damage other fan bearings and reduce hard drive performance by causing vibrational difficulties in maintaining head alignment. The fan bearings were probably irrepairably worn due to the rotor imbalance, so there was no point in repairing the unit. However, I felt there was probably some merit to seeing what happens when a 12V fan is overvolted. In my prior experience, they will make it to 17-18V before giving up – will this one behave similarly? I set up the fan with the Keysight E36103A (20V/2A) lab power supply and ran my data-logging pyvisa-based program that stepped the supply millivolt by millivolt from 0 to 20V and recorded the current consumed. Rather surprisingly, the unit did not fail entirely even at 20V, so I called in a reinforcement by series-connecting my Manson HCS-3102 to give it an 18V boost. Despite the label’s claim of 0.32A at 12V, the unit was measured drawing 286mA for an operating power of 3.4W. The unit was able to operate up to 24V when it failed suddenly. 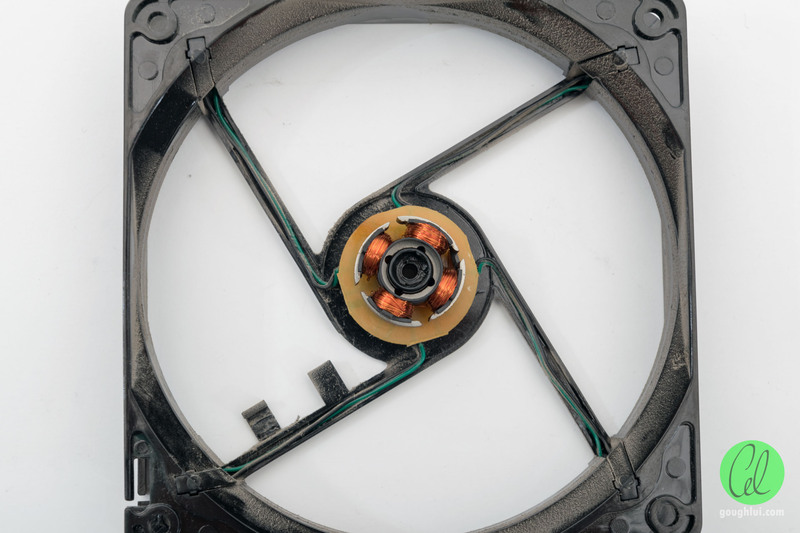 As the current limiter was set to 1A, this did not result in anything spectacular – the current jumped up to 1A for half a second and then the fan stopped spinning and consuming motor power – the LEDs continued to operate brightly though. However, exceeding about 20V was already resulting in rather toasty smells emanating from the unit – not surprising as it failed with a total power consumption of 14.1W – 4.14 times the power it normally consumes at 12V and in line with expectations for a device acting almost perfectly “ohmically”. 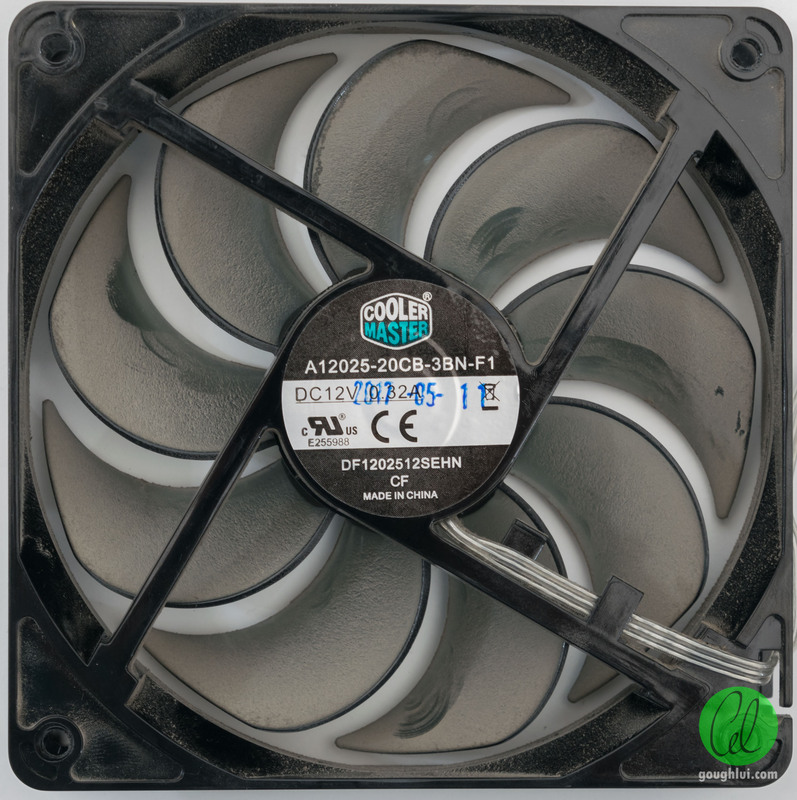 The slight blip near 2.7V symbolises the first point at which the fan starts running – a surprisingly low voltage as most older 12V fans will not do anything until they see about 5.5V. The unit was not difficult to take apart – removing the label showed the rubbery bearing end which was very much loose. The rotor almost fell out on its own accord, which seems a little strange. 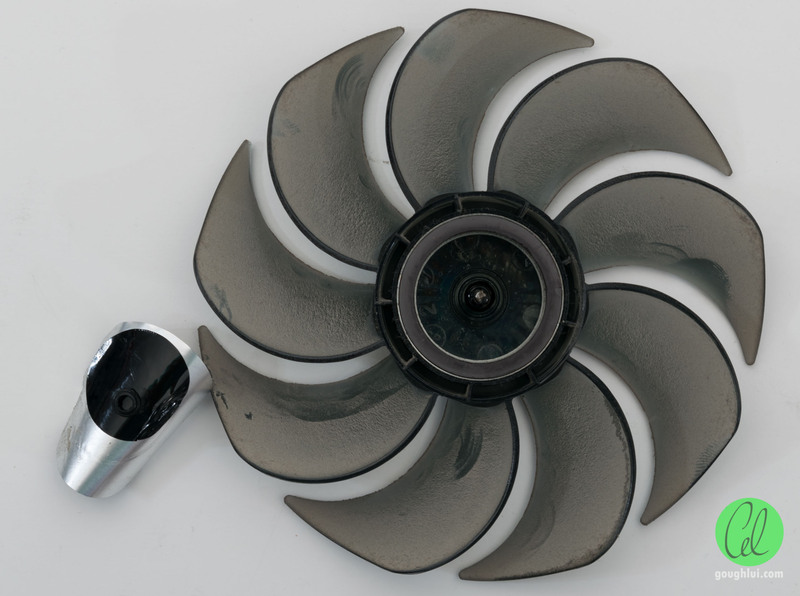 The design appears standard for a brushless DC fan with a hall-effect sensor. The unit has four poles wired as two pairs of coils. The only difference is the wires to the four LEDs on the frame. The wires appear to be super-glued to the frame and terminate in a 3mm LED. 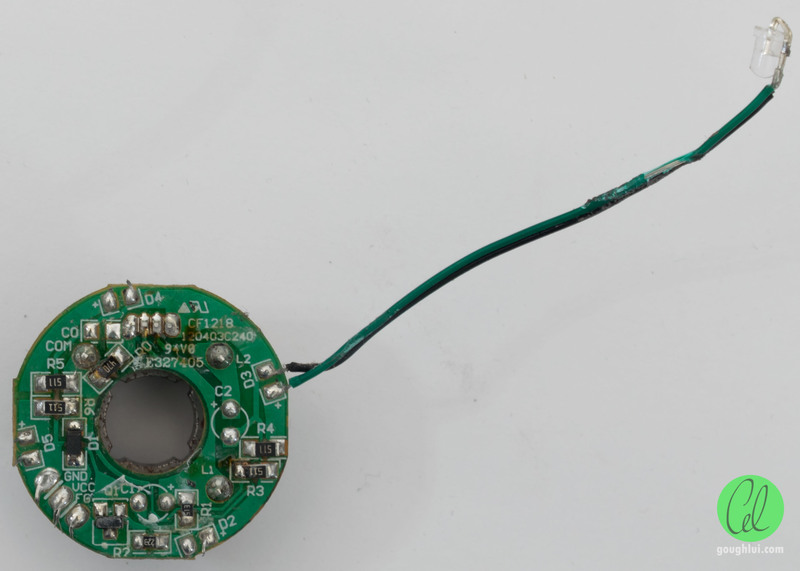 A close-up of the PCB seems rather revealing – D1 is a reverse polarity protection diode. Each of the LEDs is run through a 510 resistor of its own (R3, R4, R5, R6). 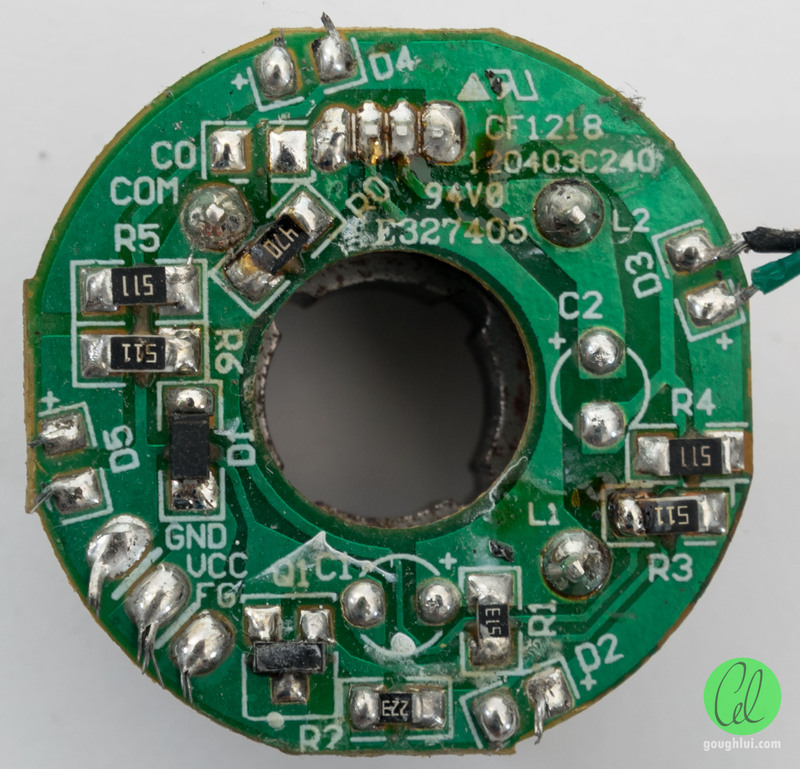 The hall effect driver IC is driven through a 47 ohm R0 which is probably the component that failed first due to exceeding its power rating and burning through. This may have resulted in a temporary short, causing the 1A current limiting event which then blew the internal coil drivers, stopping the fan dead in its tracks. Two positions for capacitors are not used at all, and an additional transistor and pair of resistors (R1, R2) may be related to the tachometer signal. 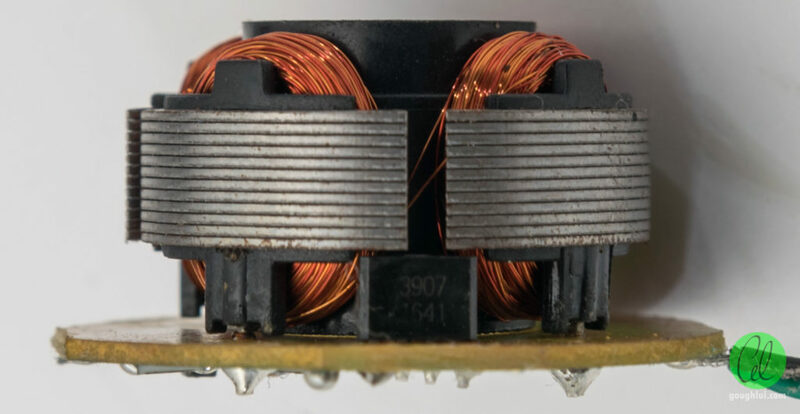 The brains of the fan is in the hall effect sensor, which is a Prolific PT3907 High output current Fan IC. This IC is specified to run between 2.7-18V for two-coil designs up to 800mA (provided a 658mW power dissipation limit and thermal limits are not violated). 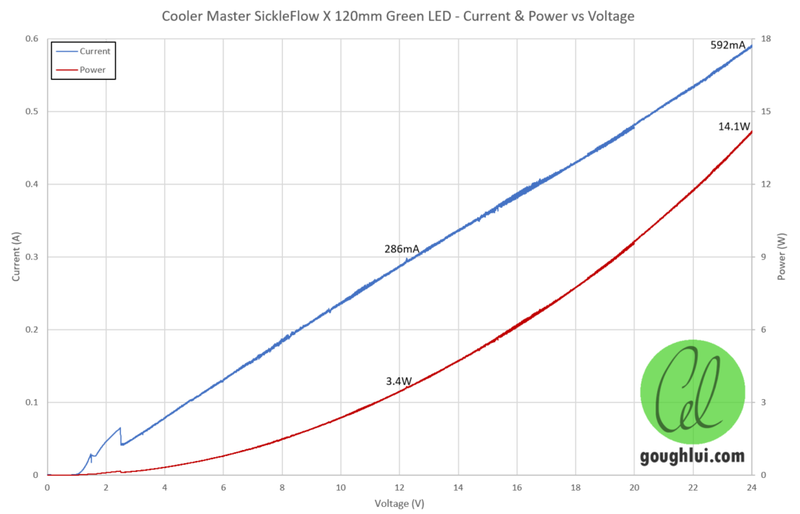 I’m disappointed in the Cooler Master SickleFlow X fans. Three fans, two failed within a year – it’s not that they were expensive, but more the amount of hassle involved in changing the fans out. It’s a bit unfortunate they weren’t better made – maybe I should start having a more expensive Noctua habit instead. Regardless, I decided to put mine out of its misery by pushing it to its limits which resulted in surprising results – the fan starts at a fairly low voltage of 2.7V and can survive 24V (for a very short period). It puts out the classic burning electronics smell prior to perishing. I for one, was a fan of torturing the sick SickleFlow. Rest in pieces. This entry was posted in Computing, Electronics and tagged computer hardware, destruction, fail, failed, failure, teardown. Bookmark the permalink.